Hey all :) I didn't plan on posting anything today, because the early access of the game Final Fantasy XIV A Realm Reborn started today! Haven't played Final Fantasy in years, kupo! But I tried the beta and it brought back so many memories that I was looking forward to play some more today. Aaaand then the servers went down, lol, so instead of looking at an empty serverlist, I decided to look at my unposted stuff. 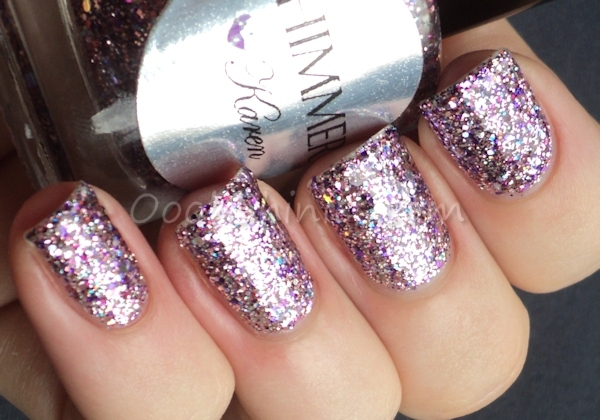 And there we have it, a post today afterall =) And it's a sparkly one, with Shimmer Polish Karen & Jenny! Karen is described as a lavender purple, but it also packs lots of big and small holographic glitter. Again 3 coats with top coat, and again perfect for layering or gradients! These polishes are so packed with all kinds of glittery goodness, making them quite tricky to capture or describe for me. But if you love glitters, I'm sure Shimmer Polish will make you squee and stare at your nails all day long! You can buy Shimmer Polish on the website or on Etsy, and you can also find Shimmer on Facebook.